This product is specific to C3d, but also C3b and iC3b, since C3d is a product from C3b. Epitope specificity differs from that of ab17455. Defects in C3 are the cause of complement component 3 deficiency (C3D) [MIM:613779]. A rare defect of the complement classical pathway. Patients develop recurrent, severe, pyogenic infections because of ineffective opsonization of pathogens. Some patients may also develop autoimmune disorders, such as arthralgia and vasculitic rashes, lupus-like syndrome and membranoproliferative glomerulonephritis. 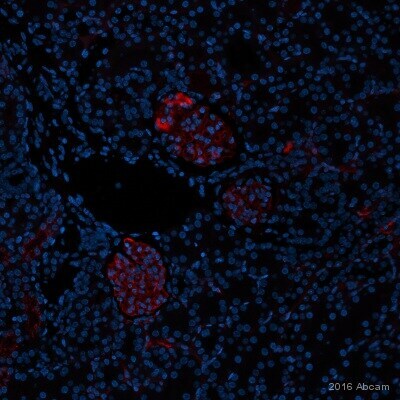 Immunofluorescent analysis of human kidney labelling C3d with ab17453 at a dilution of 1/10. Plasma of veins were stained strongly. Publishing research using ab17453? Please let us know so that we can cite the reference in this datasheet. While the optimal concentration for use of this product will need to be determined experimentally in the lab, we recommend a starting dilution of 1ug/ml in Western blot. I want to inquire whether it can detect C3b depositon about compelment activation, LPS was coated on the 96-well to innitiate complement activation. Unfortunately I cannot not find much info on the epitope of this antibody. What I can say is that is will probable recognize C3d no matter how it is formed (could be LPS activation). As I do not know where the epitope is, I do not know if it will recognize C3dg, but I think not.